ExOne has developed a new additive manufacturing process known as Water Wash-out Tooling. This new additive manufacturing technique involves the 3D printing of a core in sand, ceramics, or carbon applying a composite lay-up and curing. The final core is then washed out with only the structural composite part remaining. Developed at the company’s Materials Applications Laboratory – or ExMAL – ExOne’s water wash-out tooling process for industrial 3D printing pinpointed the limitations of traditional manufacturing techniques for tooling production with water soluble materials. The technique is intended to assist in the production of hollow parts. According to the company’s media release, ExOne’s Water Wash-out Tooling process provides manufacturers with easy prototyping for part evaluation, and can be used with Polyester, Vinyl Ester or Epoxy resins. The process is ideal for printing mandrels for filament winding, tape placement or hand lay-up; plugs and source tools; styling and design models; hollow or trapped shape fabrication; and one-off parts for part validation. “As ExOne continues to qualify applications and materials for industrial 3D printing, developing systems that allow our customers to directly print not only parts but the tooling required to make parts was the logical evolution. This new Water Wash-out Tooling process is unique when compared with traditional methods in that all of the print material can be recovered and reused for future print cycles. 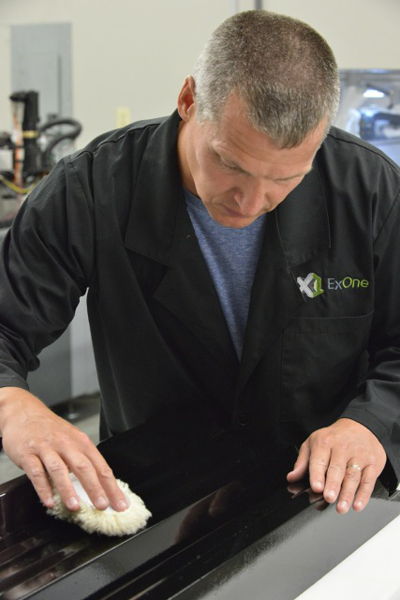 Accordingly, it reduces inventory requirements and removes moulding steps to help speed up development time,” said Rick Lucas, ExOne’s Chief Technology Officer. ExOne is a global provider of 3D printing machines and 3D printed and other products to industrial customers.